Scotch and Soda with a Quarter and Penny! Captain & Coke is the ultimate modern version of Scotch & Soda! Brought to you by The Blue Crown, Captain & Coke is made with a US quarter and penny - no more fishy coins that nobody has ever seen before! You could even borrow some change and then perform with your gimmick! 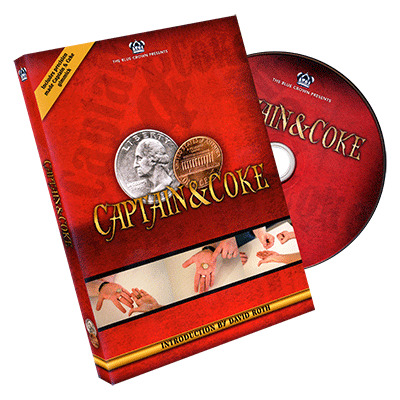 The custom-made Captain & Coke gimmick is precisely crafted by master machinist Roy Kueppers to exacting specifications. It also has a steel shim that will stick to a magnet. On the DVD, Kevin Reylek takes you step-by-step through the design and operation of the gimmick, and he also teaches routines that can be performed by beginner or advanced magicians. There is even a variation that allows you to give away the coins at the end! The Captain & Coke gimmick works perfectly for any Scotch & Soda routine and is ideal for any venue or performing style.